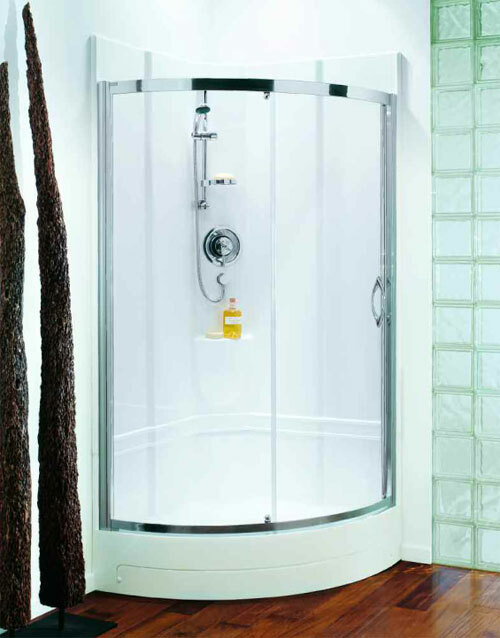 The Coram 950 Quad Shower Pod offers impressive internal space. Available with a polished silver curved sliding door. The pod is also supplied with a high performance thermostatic bar shower as standard with an option to upgrade to a concentric shower (see below). Coram shower pods are supplied with thermostatic shower mixer valves making them suitable for use on all types of hot water system - gravity, pumped, unvented and with combination boilers. A 'Bar type' thermostatic shower mixer valve is included in the purchase price. However, options are available to have a recessed concentric type valve, a 'Bar Type' valve with rigid riser/rain head/hose and handset (available at additional cost) or to have the pod supplied without shower equipment so you can fit something else (e.g. and electric shower). The 'Bar type' valve operates to a TMV2 level of control. It's operational pressure range is 0.25 bar - 5 bar (suitable for lower pressure, mains pressure, pumped and combination boiler systems). Delivery flow rate range is between 5 and 13 litres per minute. The 'Concentric sequential type' valve operates to a TMV3 level of control. It's operational pressure range is 0.1 bar - 10 bar (suitable for lower pressure, mains pressure and pumped systems). Delivery flow rate range is between 14 and 35 litres per minute. Equipped with anti-scald rapid cut-off. The sequential valve offers 'easy to grip' single lever operation and a good visual reference to favourite temperature setting. 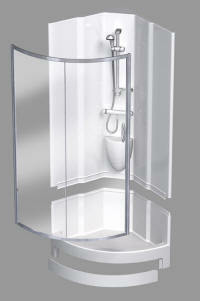 Pictured left is an exploded view of the CORAM shower pod. You will notice that the pod is constructed from two main sections onto which the enclosure door is fitted. Attention is drawn to the lower section of the shower pod which has a particularly tall upstand at the rear of the tray. This negates any risk of water escaping to the rear - an area prone to leaks in a conventional shower. The joint between the upper and lower pod sections is designed in such a way that water cannot escape at this point either. Pipework (and/or cables) can be conveniently run in the duct behind the corner and connections made underneath the tray via the service hatch.